Christmas Eve in my study has a form that must be followed. Thalia, although of tender years, insists on decorum. Traditions survive because of children. We start with my reading The Night Before Christmas to her and Teddy, all of us squeezed between the arms of the comfy chair by the hearth. Over the hearth fire is a three-legged cast-iron pot containing mulled cider warming up to be ladled out into cups; the convenience of a microwave is not to be considered. I recently found out there is a controversy surrounding C. C. Moore’s rendition of the poem, but that sort of thing cannot be mentioned now. The poem—tonight—is sacred. Following that, it is my choice what to read. Grimm has nothing about Christmas in their canon. A winter-themed story that I have not already read to her and Teddy proves hard to come by, but I manage. I peruse my copy of Jack Zipe’s translation of Grimm, finding what I want in the third story from the last. The Winter Rose. It is a Beauty and the Beast variant, complete with a traveling merchant, three daughters, and three requests, the youngest asking for a rose. As it is winter, the merchant cannot find a rose. On his return trip home, he comes across a garden, half in winter, half in summer. The summer half has roses in bloom. The merchant picks a rose and returns to the road. A black beast chases after him, demanding with a threat that his rose be returned. 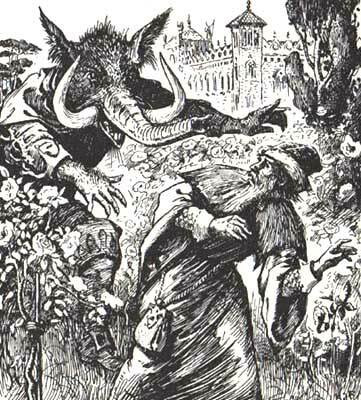 The merchant ends up keeping the rose, thinking he has outwitted the beast, but the beast forcefully seizes his youngest daughter and take her to his castle. There the violence ends. 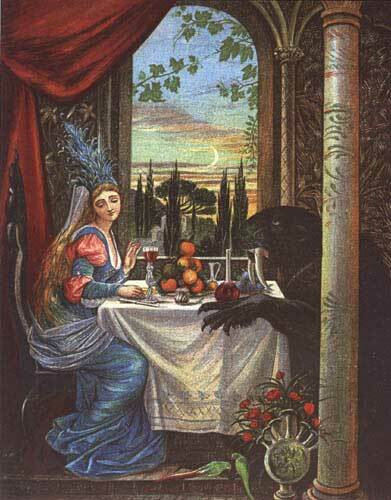 The beast dotes on the girl until she becomes fond of him. After a time, she wishes news of her family. The beast shows her a mirror in which she can see what is happening at home. Her father lies on his deathbed. At this point in the story, we stop to serve ourselves some cider. Thalia provides a doll’s teacup for Teddy’s cider, but I am sure he is going to spill it. The daughter pleads with the beast to let her visit home and he relents, allowing her a week but no more. During her visit the father dies. In her grief, she overstays her time. Upon return to the beast’s castle, she finds he has disappeared. Winter dominates the garden. There she finds a heap of rotting cabbages, under which she uncovers the beast, who appears to be dead. She pours a bucket of water over the beast to revive him. Up rises a handsome prince, the garden returns to summer, and they marry. “I like the garden,” says Thalia, finishing her cider. I like the garden too. She toddles off to bed, dragging Teddy behind her. I clean up the cups and the spill. Has anyone explored the role of gardens and cabbages in fairy tales? That does sound like a pedantic inquiry, even to me. But I am conscious that while popular fiction dwells on the unusual, exotic, and exciting, my genre pulls from the mundane. Popular fiction plucks low-hanging fruit, fairy tales look at the root. It’s Boxing Day and I visit Augustus, bearing the gift of a quality fountain pen, knowing his abhorrence for other ink devices. The shop isn’t open, but Augustus lives above his store, and his friends know the shop door is unlocked on this day after Christmas. As I enter, I am delighted to see Duckworth already there, the two of them surrounded by a haze of pipe smoke. Duckworth’s waves his hand in a gesture of acquiescence. “The Winter Rose,” I supply. “Seven,” I say, taking out my pipe. “All of the above, I’d guess.” Duckworth puffs contentedly. He’s smoking “Elfish Gold” I realize. The smell of burning logs on the hearth sets me at ease. The glow from the fireplace illuminates my corner of the study. A Chromebook glows over my fingers, a Christmas present from my daughter. I like that they call it a “book.” That gives me permission to have it in my lap. I tip-tap in “roses in fairy tales.” Below the offers to buy roses in fairy tales from various proprietors, Grimm stories with the word “rose” appear, Snow White and Rose Red, Briar Rose, and The Rose. I follow the link to The Rose. It’s an odd little, grim Grimm tale about a youngest son encountering a child in the wood, who gives him a rosebud, saying he will visit again when the rose blooms. The next day the rose blooms, and the mother finds her youngest son dead. The Winter Rose does not appear in the listings. Typing in “roses symbolism” brings a wealth of information. Starting with the Wikipedia entry, and linking through the other offerings, a consensus emerges. The rose, as a symbol, pervades Western culture. The name Rosicrucian has something of the same origin, in that the rose lies at the heart of their symbol, the Rose Cross. Another fun item: the rose holds the honored position of being the national flower of England. That came about with Henry VII, who introduced the heraldic Tudor Rose, which is composed of the red rose of the House of Lancaster and the white rose of the House of York. Henry ended the fifteenth-century civil war—later branded the War of the Roses—between the two houses by defeating Richard III in battle (A horse! A horse! My kingdom for a horse!) and marrying into the House of York. Continuing my search, I find a lot about the rose representing the Virgin Mary and other sainted women, the rose garden symbolizing Paradise, and the rosary connection to our flower. When I consider the rose appeared in the Old Testament largely metaphorically and not symbolically, and does not appear in the New Testament (according to my source), I jump to the assumption that the rose in Christianity is a medieval invention. 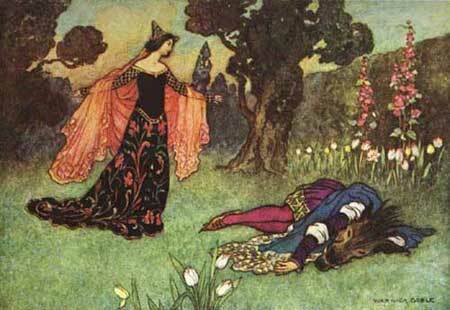 My “Ah ha!” moment comes when the internet provides a link to Tam Lin. Tam Lin, of course, that quintessential Scottish ballad. I had not seen Tam Lin in the usual list of Beauty and the Beast variants, probably because it is a ballad. The ballad dates to at least as early as 1549. Given its age, I wonder if it might not be the inspiration for that plucking-of-the-rose motif. I look up at the hearth. For a moment I see a rose in the flames, its solid red petals and verdant green leaves in contrast to the orange and yellow flames. It quickly turns to ash.